Giovanna: I still have a postcard you sent me from the North Cape in '66. 'Everything that exists is beautiful.' With three exclamation points. Do you still believe that? Nicola: I don't believe in exclamation points anymore. 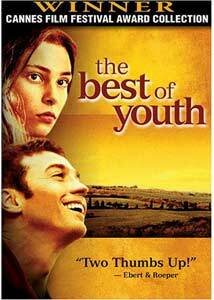 The fact that The Best of Youth is six hours long quite possibly means you will never see it. You are missing out. Yes, it's a long film, but the running time is its greatest asset, not something to be overcome. This is a film to savor like a good book, with a scope that's far more ambitious than a two-hour film could hope to handle. The ambitious plot follows the lives of two brothers over 35 years of Italian history, through times of peace and political turmoil, of floods and recessions and underground revolutions. I can't say I know a lot about the events of the past half-century in Italy, but, as they are in any good story, the themes are universal. We begin in 1966, with Matteo (Alessio Bono) and Nicola (Luigi Lo Cascio) Carati. They attend university, where Nicola has just passed his doctoral exams and Matteo is studying literature and working part time at a mental institution. There, he encounters Georgia (Jasmine Trinca), a young patient being driven slowly insane by a treatment regime of electroshock therapy. One night, Matteo decides to free her, and the brothers plan to take her with them on a trip around the world. Before they can leave, the police discover her, and though the brothers aren't implicated, the incident changes both of their lives forever. Nicola decides to go on the trip anyway, and spends years living abroad, doing odd jobs. Matteo, impulsively, decides to join the army. They don't see each other again until several years later, after a flood has devastated the city of Florence. Nicola is one of the motivated youths that have come to help save old books and historical documents; Matteo is there in uniform. Among the rubble, Nicola encounters the beautiful Giulia (Sonia Bergamasco), who plays a piano rescued from the waters, and falls in love. Nicola and Giulia live together and have a daughter, Sara, but Giulia is restless, and drawn into an underground terrorist group known as the Red Brigade. One night she decides she must leave her daughter, and Nicola doesn't do much to stop her. Meanwhile, Matteo has joined up, become a police officer, but he's still driven by his emotions. While on mandatory leave after roughing up a suspect, he meets Mirella (Maya Sansa), a photographer who falls in love with the image of a Matteo she never really comes to know. A summary of the plot could stretch on for several hundred more words. Other stories are woven into the lives of Nicola and Matteo, and disparate elements of the story often tie together in expected or surprising ways. Their older sister Giovanna (Lidia Vitale) is a judge, and has reason to fear the Red Brigade, as does Carlo (Fabrizio Gifuni), who marries younger sister Francesca (Valentina Carnelutti). The boys' mother (Andriana Asti) loses a husband but finds joy in an extended family she didn't know she had. Sara grows up and finds love, and discovers the truth about her mother. Despite a large cast of characters and a story that spans decades, The Best of Youth never feels rushed or confused, even for the viewer who doesn't have the benefit of a knowledge of Italian history. Usually you only get to know characters this well on television (well, good television, anyway); director Marco Tullio Giordana originally produced the film to be shown on Italian TV, but it debut at the Cannes Film Festival for financial reasons (the network that paid for it felt it was too challenging and intellectual�too good�to air on the televisione). With time to spare, Giordana has the luxury of letting us watch the characters grow old and change, and by the end, we feel like we know them, like they'll continue to exist long after the credits roll. I imagine this film would carry even more weight for an Italian audience; for me, it worked well enough as a drama with an epic scope focused on intimate character development. And, really, if you're going to spend six hours somewhere, you could do a lot worse than Rome, Turin, and Florence. Image Transfer Review: Filmed with 16mm stock for presentation on television, The Best of Youth wound up premiering in theaters at film festivals, and is presented on DVD in a fine-looking transfer taken from a 35mm blowup of the original negative. Most of the film looks great, with sharp images and natural colors. Only in a few spots, often brightly lit, outdoor scenes, can you spot the increased grain of 16mm. I didn't notice significant edge enhancement, and the film has been given room to breathe on two DVDs. Audio Transfer Review: Audio is presented in a very basic Italian 2.0 mix. Speech comes across naturally and the score fills out the front soundstage, but the surrounds are muted throughout. Extras Review: Though two- and three-disc special editions were released in other regions, this disc includes no extras at all. Chaptering is barely adequate and, while I'm complaining, the lame cover art and tagline aren't doing the film any favors, either. Rich and rewarding, with a depth justifying its six-hour length, The Best of Youth is an engrossing look at four decades of Italian history and the lives of two brothers. Just as you don't want to finish a good book, this is a film you won't want to end, and considering the running time, I'd say that's the ultimate compliment.